Setting the Release mode dial on your Nikon D7200 to Continuous Low or Continuous High enables burst mode shooting. That is, the camera records a continuous burst of images for as long as you hold down the shutter button, making it easier to capture fast-paced action. Continuous Low: In this mode, you can tell the camera to capture from 1 to 6 frames per second (fps). 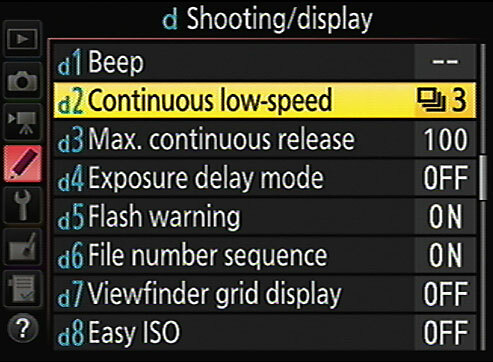 Set the maximum frame rate by choosing Custom Setting > Shooting/Display > Continuous Low-speed, as shown. The default is 3 fps. You can modify the maximum frame rate for Continuous Low Release mode. Why would you want to capture fewer than the maximum number of shots? Well, frankly, unless you’re shooting something that’s moving at a really fast pace, not too much is going to change between frames when you shoot at 6 frames per second. So when you set the burst rate that high, you typically wind up with lots of shots that show the exact same thing, wasting space on your memory card. You can’t use flash. Continuous mode doesn’t work with flash because the time that the flash needs to recycle between shots slows down the capture rate too much. So even if the Release mode dial is set to CL or CH, you get one shot for each press of the shutter button if the flash is raised. Images are stored temporarily in the memory buffer. The camera has some internal memory — a buffer — where it stores picture data until it has time to record it to the memory card. The number of pictures the buffer can hold depends on certain camera settings, such as resolution and file type (JPEG or Raw). In the viewfinder, Information display, and Live View display, the buffer capacity appears in place of the shots-remaining value when you press the shutter button halfway. For example, if you see the value [r 21], the buffer can hold 21 frames. After shooting a burst of images, wait for the memory card access light on the back of the camera to go out before turning off the camera. That’s your signal that the camera has moved all data from the buffer to the memory card. Turning off the camera before that happens may corrupt the image file. If the Image Area option is set to DX (the default) and the Image Quality option is set to 14-bit NEF (Raw): The maximum fps drops from 6 to 5 for both the Continuous Low and Continuous High Release modes. (Even if you select 6 fps as the Continuous Low-Speed option, the camera maxes out at 5 fps.) Why the slowdown? Because the 14-bit NEF (Raw) setting increases the image file size, and it takes more time for the camera to write the data to the memory card. If the Image Area setting is 1.3x and the Image Quality setting is JPEG (the default) or 12-bit NEF (Raw): The maximum fps for Continuous High goes up to 7 fps. The camera can achieve this faster pace because the 1.3x Image Area setting captures a smaller image than normal, resulting in a smaller file size and faster data transfer. You just have to avoid setting the Image Quality setting to the 14-bit NEF (Raw) option, or you’ll offset the reduction in file size. Your mileage may vary. The actual number of frames you can capture depends on a number of other factors, too, including your shutter speed. At a slow shutter speed, the camera may not be able to reach the maximum frame rate. Enabling Vibration Reduction also can reduce the frame rate, as can a weak battery. Additionally, although you can capture as many as 100 frames in a single burst, the frame rate can drop if the buffer gets full.